There’s been a lot of changes announced for the titles of the New DCU 52 but for this book we get a change in artist after just three issues with the launching creative team. Although I will miss CAFU’s art, it’s awesome that his replacement is Wildstorm veteran artist Scott Clark. I haven’t seen his art in ages and his style brings back good memories for me from the old Image Comics days. This was definitely the most action-packed issue of the series so far. 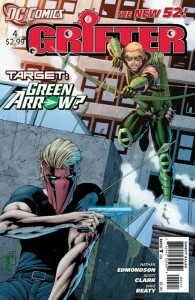 From the moment Grifter shows up and begins his confrontation with Green Arrow, it is almost non-stop action until the end of the issue. When you have two characters crossover like this sometimes you have to let loose and give the fans what they want; one hell of a fight! 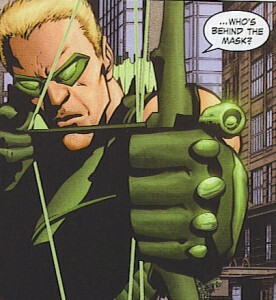 I’m not following Green Arrow’s title and my exposure to the character in the past has been limited to his appearances in Justice League. 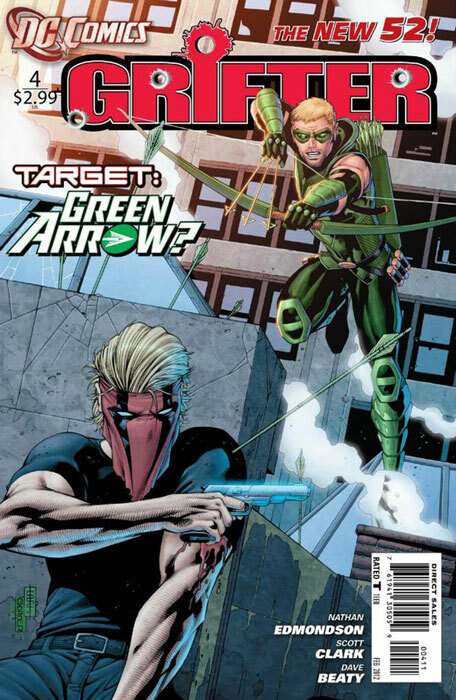 I know that as part of the New 52, Green Arrow is a younger incarnation. I think his youth is used very effectively and as much as I hate to admit it, he does give Grifter a run for his money. I’m trying to stay away from spoilers but let’s just say, as much as I wanted a different outcome to their fight, I kind of knew that is was inevitable the way it ended. When I first saw that Green Arrow was going to be crossing over with Grifter I was a little leery but it ended up making for a great issue. Because of the way the issue ends, Green Arrow could potentially show up again, but they left it to where it could go either way. 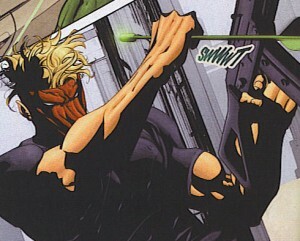 I definitely would not want Green Arrow to have Grifter become a nemesis of sorts but their battle did prove to me that their pairing was worth the time story wise. Overall, an excellent issue that I didn’t mind was as fast-paced as what we’ve gotten so far. I look forward to this new team of Edmondson and Clark giving us a high-octane action title which is exactly what a Grifter comic should entail. This entry was posted in DCU, Grifter, Reviews and tagged green arrow, grifter, Nathan Edmondson, scott clark. Bookmark the permalink. The best part of this issue for me, is the subtle nod to upcoming crossovers. Demon Knights #4 had it, too. Daemonites = Demon Knights..?